Did you know the American Ladder Institute (ALI) recognizes organizations that go the extra mile to uphold ladder safety with ALI’s Ladder Safety Ambassador program? Ladder Safety Ambassadors are companies and schools that have received 10+ passing scores (awarded a score of 90% or greater) in ALI’s Ladder Safety Training—a no cost certification program that can help employees and students work smarter and safer. Ladder Safety Ambassadors are leaders in their communities and their industry, as this designation confirms an organization’s dedication to its employees’ safety. Explore a list of current Ladder Safety Ambassadors here. Wherever an organization is on the ladder safety spectrum—not quite a Ladder Safety Ambassador or a long-time member—National Ladder Safety Month is a great opportunity to create a culture of safety. The third annual event is held February 24-March 30, 2019—it celebrates and educates on ladder safety through promoting the ALI’s Ladder Safety Training and free resources that inspire better work practices. Are You Within Arm’s Reach of Achieving Ladder Safety Ambassador Status? It only takes 10 passing scores to secure Ladder Safety Ambassador status. Use this year’s upcoming National Ladder Safety Month to engage more employees to earn their ladder safety certification, and join the ranks of companies who’ve placed the highest priority on employee health and safety. Once certified, organizations receive an exclusive ALI Safety Ambassador logo and access to a robust toolkit to help spread the word about the status. 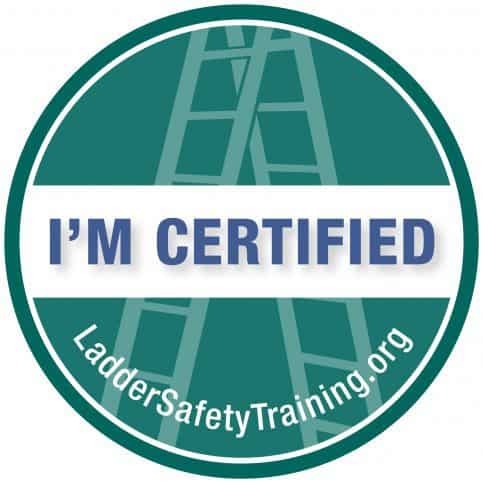 Organizations can also proudly announce that they’ve reached their certification with a special “I’m Certified” graphic and post it to social media using #LadderSafetyMonth. Ladder Safety Ambassadors set the standard for which other companies strive. They can showcase their achievement by displaying the “I’m Certified” graphic on their website and social media pages. Sharing this graphic lets customers, employees, and colleagues know their dedication to safety. ALI also encourages organizations to leverage the Safety Ambassador logo and toolkit. If you do not have access to these materials, contact info@americanladderinstitute.org. ALI also encourages Ladder Safety Ambassadors to send photos of how they’ve made their work environments safer to marketing@americanladderinstitute.org. ALI will use these photos to encourage other workplaces to adopt similar practices with the ultimate goal of preventing potentially fatal falls. If you’re a teacher or student at a vocational school, Ladder Safety Training is a great way for you to adopt the safe work practices of ALI’s Ladder Safety Ambassadors. Teachers may consider integrating Ladder Safety Training into their curriculum, and students who become certified in ladder safety will kick start their professional development. If you’re a teacher, select “Training Manager” while registering, so you can track your students’ performance. Interested in learning more about ALI Ladder Safety Ambassadors or National Ladder Safety Month? Contact ALI at marketing@americanladderinstitute.org.